How to Stay Tender and Why… In 31 Sentences. 1. Don’t reach for your phone or laptop. 2. Close it all down, and breathe. 3. There are times for marathoning through, for zipping up and getting it done, for reaching out for some sort of escape. 4. If this isn’t one of those times, don’t do it. 5. Don’t starve yourself of your humanity, your humility. 7. All the way into the muddy, fertile ground of exactly how it is. 8. Imagine yourself laying calmly there, naked backside held by a cool and wet ground. 9. Imagine that all of life and existence is holding you–all that has come before you and died, all that will never last forever, all that will try to hold on just as you are–is with you in this very moment, this very fragile inhale, exhale. 11. As you inhale, you may quiver. 12. As you exhale, you may burst. 13. Like a hundred floating seeds of a fearless dandelion, just after a wish is cast. 14. This is your time for wishing; for connecting so honestly to what you really, truly want. 15. For mourning, so shamelessly, for what never came to pass. 16. It’s okay to be human–to wish some things weren’t so. 17. And it’s okay to sink even further down, into the ultimate truth that knows: we can run but we cannot hide. 18. We cannot evade loss. 19. We cannot avoid suffering. 20. If you run now, you will get caught later. 21. Once you have tired and lost your breath, it will catch up with you and,Tag! You’re it! 22. It will be your turn to chase down the pain; your turn to dive into the mud of humanity. 23. And like a bath, you will wash yourself with cool, dark truth. 24. You will exfoliate your heart and throat, crying and laughing and laying still in the balmy calming aftermath. 25. In that stillness, you will find a mirror. 26. You will look past your own eyes, into the human condition. 27. You will see how brave we are, how hard we work, how we are a people who try. 28. And even though our trying doesn’t always get us what we want, it is our signature move. 29. Among the humans, there is a debate over our plight being laziness or fear; but that assumes that we are plighted–that we cannot survive our own condition. 31. Even here, there is beauty, if you stay long enough to see it. 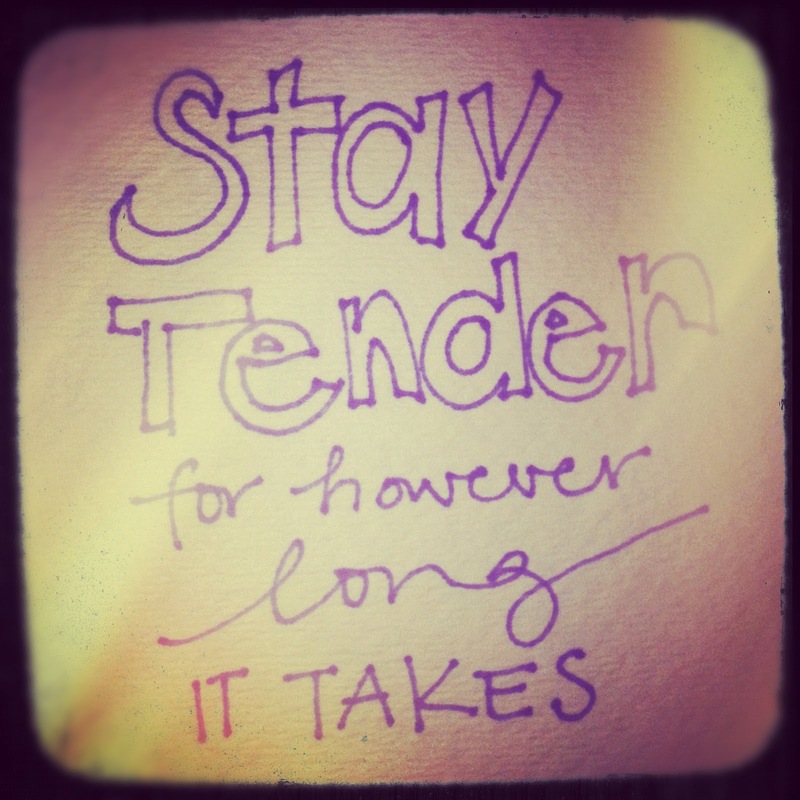 What’s your take on tenderness?–Your journey with facing pain or panicking when it comes up? The comments are yours for revealing it all. We love you just the same.